When King Will Sliney (Irish Comics Superstar) and Bruno Batista from Big Bang Comics (Hand of the King) invite you to take part in a massive free comics event in Cork, you say yes and bend the knee! So with that in mind this past weekend the Rogue Comics Crew as well as an abundance of amazing comics creators from around the country hit the road and headed to Mahon Point Shopping Centre for Cork Comics Expo 2 affectionately known as "Slineycon". In attendance from Rogue Comics were Wayne Talbot (Creative Director), Ciarán Marcantonio (Editor-In-Chief), Gill Dempsey (Editor), Cork's own prince Kevin Keane (Art Director), Clare Foley (Artist), Cormac Hughes (Artist), Ellen (Rogue Roadie), Robert Carey (Artist) and even surprise appearences from Brian Corcoran (Artist) and Alice Coleman (Graphic Designer). We brought along our entire range of Comics and our Artists were well stocked with new prints to sell. We arrived at the centre with a rough idea of what to expect, a good crowd, the opportunity to see some portfolios and hopefully we make some sales. But as the day progressed expectations were thoroughly exceeded as from 9:30am to 7:00pm every table (of which there were many) was busy from start to finish with an audience of people excited to talk about comics. Now that would be normal for any comic convention right? Well that's where Cork Comics Expo is different to every other con I've attended this wasn't your normal convention audience. The main attendee's were the everyday shoppers of Mahon Point, made up mainly of families that wouldn't necessarily have any interest in attending such an event. But here it is right in front of them as they go for their weekly shop. That provided the entire Irish comics community with a wonderful opportunity. The chance to show our work to a completely new home grown audience. So that's exactly what we did! With our table stocked with the full range of books from the Rogues Gallery of titles we proceeded to sell our wares to the good people of Cork. But selling isn't all we did, our own Kevin Keane took the time to host an art class for local children who aspire to be the next generation of budding comics artists in Cork. Back at our table Wayne, Ciarán and Rob took the time to review portfolios of some of the local artists who had brought along their work. We were blown away by some of the talent on show and there may even be some future Rogues among these up and coming young artists, writers and colourists. We have to give a special shout out to a wonderful comic - The Mitchelstown Library Teen Anthology "My Life In Strips". This awesome project was put together to encourage teens to be creative and the results speak for themselves. A lot of the creators involved swung by our table to ask what we thought of their book. 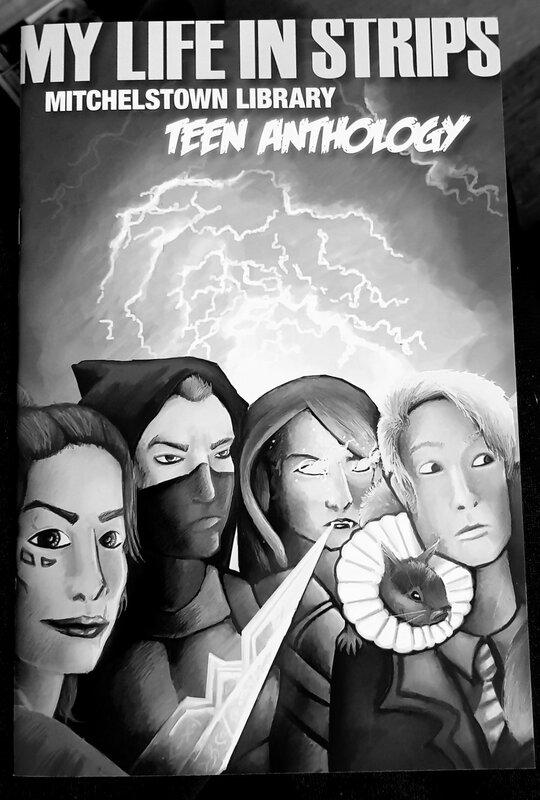 Honestly we were blown away, the book shows a level of talent in these teenagers that far surpasses the comic abilities anyone from Rogue had at their age... we may all be out of a job soon. If you're interested in finding out more about this project contact the books editor Fiona Boniwell. The day was full of great interactions but one more Kevin Keane moment springs to mind that really was a heart warmer. Totally unexpectedly a man by the name of Paul Philpott came to the table asking for Kevin, upon meeting him he presented Kevin with a huge canvas print of a recent commission Kevin had done for him of his son. As you can see by Kevin's face he was really happy with it. Its these kind of moments where people really connect with an artist and their art in such a way that they feel the need to express such gratitude for the work involved that really make conventions worth while, you can't put a value on that kind of experience. 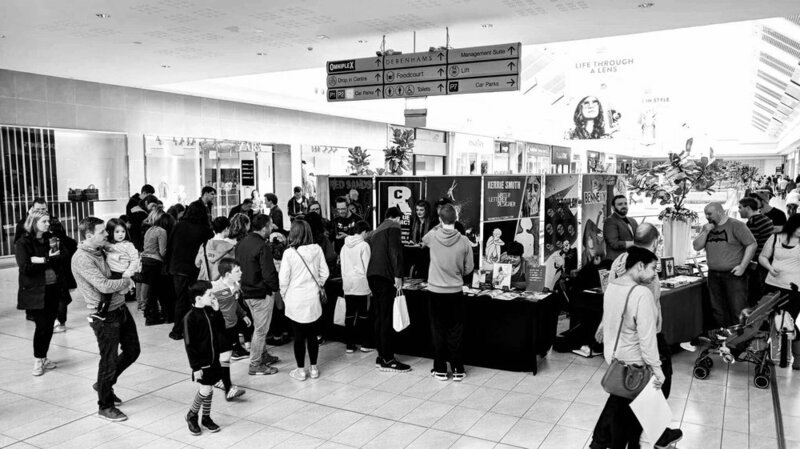 Overall the day was a huge success and we can't thank Will Sliney, Bruno Batista, Big Bang Comics and Mahon Point Shopping Centre enough for having us. If such an event rolls around again we'll be sure to be there. These events are so important to the Irish Comics Community for building ties to a local audience and talent pool that they cant be missed. There were more tales from this epic trip but most of those took place in Barcadia with drink taken... and that's where they will stay! One last thought. You can't spell Sliney without line... Hail to the King!